Mike Meredith was a veterinary surgeon for 30 years before starting his second career in 2002 as an Holistic Healer & Stress & Wellbeing Coach for humans. He provides 1-to-1 healing and coaching work, as well as running courses in Mindfulness, Meditation, Stress & Wellbeing & Healing/Self-Healing at Community Colleges in Cambridgeshire. Mike has an honours degree in Physiology, a City & Guilds Level 4 Certificate for Teaching in the Lifelong Learning Sector and a Cambridge University MA for contributions to professional training and research. He is also a former martial arts instructor. He trained for 2 years from 2007-9 as a dance leader with the "Dances of Universal Peace" [DUP] international multifaith spirituality organisation and has been leading Spiritual Dance, Breathwork & Walking Meditation Sessions at local, regional and national DUP events since 2010. Mike has trained in Meditation, Mindfulnes, Intuitive Massage & Healing Skills since 1988 under a vast range of teachers, approaches and traditions. In 1996, while meditating with friends, he received a visionary calling to the Shamanic Healing path and in 2003 was initiated into the Priesthood of the Chalice Well in Glastonbury in 2003: photos. In 2004 Mike Co-founded the Cambridge Healing & Holistic Lifestyle Group, in 2010 Co-founded the UK Shamanism Today Group, and in 2013 Founded the "Holistic Health, Healing & Wellbeing: Cambridgeshire" Group. He continues to co-lead these groups. He comments... "Connection to nature, animals & people has always been at the heart of my life! After training as a physiologist & veterinary surgeon, I worked as animal healer & trainer of veterinarians until a mid-life death/rebirth experience which culminated in an unexpected visionary calling to the Shamanic Path in 1997. "I trained with many teachers and went on to run my own shamanism courses plus workshops at UK national conferences of Shamanic Practitioners. 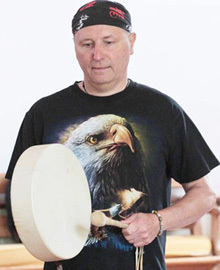 I am a mentored leader of sacred dance & song with the "Dances of Universal Peace" movement, co-founder of Cambridge Healing & Holistic Lifestyle Group and the "UK Shamanism Today" group on Facebook. 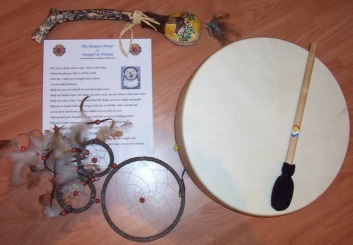 "My healing and teaching work draws on ancient indigenous + modern psychotherapeutic tools,. also coaching in intuitive & psychic skills, meditation & mindfulness, stress-management, energy-healing, soul retrieval & psychic protection. My soul-path is internal + external harmony + integrated honouring of Ancestors, Nature, Community & Spirit!" We cannot solve the problems we have created, with the same thinking that created them! Thanks for dropping by! Sunflower Health services are devoted to holistic health and healing, especially the world's most ancient and popular holistic art & science of healing: "Shamanic Healing". Harmony & Connection to Nature & "The Divine"
The way I work is to facilitate people connecting to their own healing wisdom and personal or shamanic development path. My task is to help folks connect to their range of inner and outer resources for this journey and to help them see, confront and transform what is blocking or holding back their own self-healing. I can provide a soul-retrieval, spiritual healer, holistic healer, energy healer or life coaching [find your soul purpose!] service as required. Many of my clients want to lay to rest past trauma or grief experiences, including sexual abuse and domestic abuse, so that their life can move forward with meaning and fulfilment. 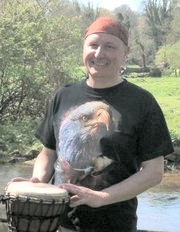 Shamanic Journey Drumming, Cord-Cutting Rituals [ending addictive or destructive relationships], Holistic Grief Therapy, Past-life regression, Power Animal & Spirit Guide Connection, Soul Retrieval, Clearing/Extraction/Release/Transformation of "Alien" Entity & 'Possession Syndrome', Spiritual Healing, Shamanic Massage, 'Drum Washing', Aura cleansing, Timeline Healing. Want to know more about Mike & Sunflower Health? Michael J. Meredith BSc BVetMed, MA, PhD: Connection to nature, animals and people has always been at the heart of my life. I trained as a physiologist and veterinary surgeon and worked as an animal healer and trainer of veterinarians for 26 years, until in 1997 while meditating with a solstice group, I received a visionary calling to the Shamanic Path. A succession of teachers and magical experiences entered my life - a process which continues to this day. 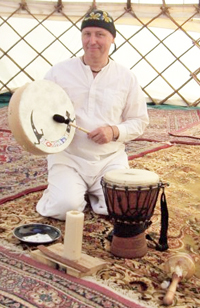 I have presented workshops at two national conferences of UK Society of Shamanic Practitioners and am a mentored leader of sacred dances and songs with the "Dances of Universal Peace" movement. I draw on practices and wisdom from a wide-range of ancient and modern shamanic traditions and provide personal consultations plus public workshops on shamanism, shamanic healing treatments, intuitive and psychic skills, stress management, energy-healing, soul retrieval and psychic protection. I am co-founder of the Cambridge Healing & Holistic Lifestyle Group and the "UK Shamanism Today" group on Facebook. I see Shamanism as a path for cultivating internal and external harmony via the blending and honouring of [inner and outer] Nature, Community and Spirit.